Last night I waged war with a fit ball. I’m disinclined to say I lost. For it’s not over yet. We’ll do battle again shortly. Being ever so thoughtful, the little sis sent over her spare fit ball for me to use (I think she’s somewhat excited I’m finally actually and seriously dedicating a significant amount of time to ‘getting flexible’). It was deflated and all ready to be pumped up with the pump that she sent in the second package (because, well it may have been forgotten the first time round). The excitement built as I waited for that second package to arrive. The fit ball was there sitting on the middle of my floor, ready to be restored to it’s former, bouncy and inflated glory. I sat down on the couch and looked at it. How best to tackle the task ahead? Just get in and do it I guess. So I pumped, and pumped and pumped. After what felt like simply hours of working at a teeny, flimsy pump the ball began to slowly take shape. To rise out of it’s crumpled state. As we neared the perfect spherical shape that it should be we hit a major hurdle. I pulled at the pump to remove the needle and stopper the valve with the little stopper fandangle provided. Nothing happened. I pulled again. This time the pump did budge, and so quickly that it nearly knocked me out, however the needle was left behind. Clearly they were no longer friends. It had been too arduous an affair for the both of them to stay together. No amount of prying or pulling could remove the darn little thing from the valve, which by the way appeared to have magically shrunk during the inflating of the ball. Slowly but surely the fit ball began to deflate with a quiet hiss. It didn’t like being pumped up, no thank you. Muttering and cursing under the breath failed to persuade the ball to release the needle. In a fit of rage I fled to the shower, hoping things would be magically fixed upon my return. Not the case. The fit ball looked at me from it’s perch on the couch like a sad, saggy old man’s belly, slowly sinking towards the ground. Damn you fitball. Now, you’re probably wondering how that very long-winded story has anything to do with a dip of all things. Plenty, plenty. For the whole reason behind acquiring a fit ball was to (apart from improving my flexibility from what a recent pilates instructor called ‘shocking’) practice relaxing. Stretching. Do things that are good for your body that often we say ‘nahhhh I don’t have time for that’. And then do something else with that ‘no time’. Such as running/studying/working/anything that exacerbates the current situation of inflexibility/stress etc. These things include taking the time to make simple things from scratch. Dip is often associated with relaxing, am I right? 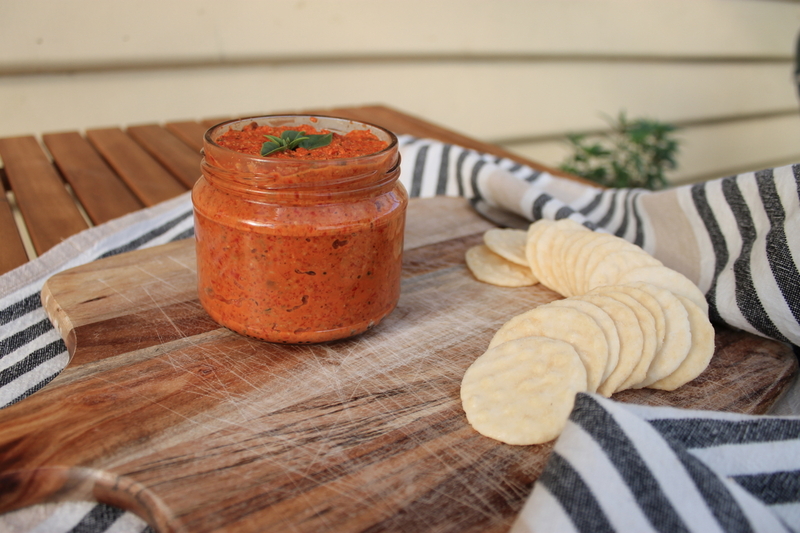 Think cider, dip and crackers on the front porch as the sun goes down. 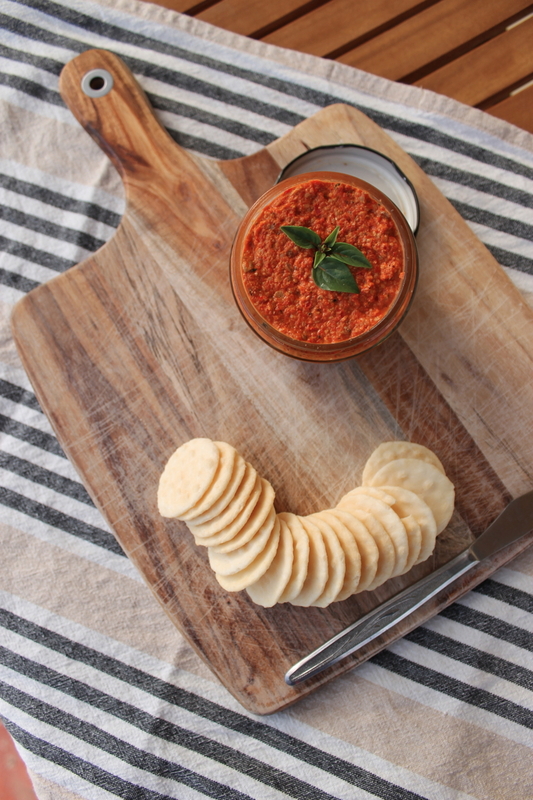 A lunch of dip+bread when you’re camping and that’s all you feel like. Part of a mezze at a fancy dinner party (at someone else’s house, because if you’re hosting there’s a wee chance it could be stressful). 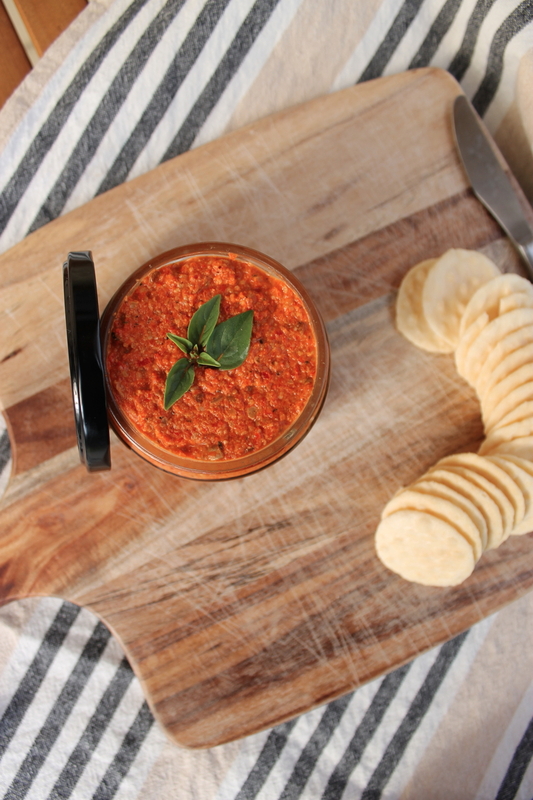 So if you’re already part way to relaxation with the aid of a dip (and we are talking about the food one here, however it could also include one in the ocean if you so fancy), why not go the whole hog and make your own? Make the conscious effort to clear the time to do so. To not be frantically running around like a headless chook 24/7. C’mon admit it. We all do that more frequently than we really should. This particular dip is dairy free. It’s filled with tasty toasted seeds that provide an intense nuttiness. It’s spicy with a touch of cayenne. Why, it’s even sweet from the roasted capsicum. And there’s herbs in the form of basil and rosemary (fun fact: my absolute favorites). Try to find all of that in the one dip from a supermarket. Hah. While the capsicums are roasting you can take the time to stretch/listen to calming whale music/lie on the floor and stare at the ceiling/whatever makes you mind and muscles melt. And then you can continue the whole doing-good-things-for-your-body by eating the said dip: there’s not an ounce of ‘badness’ in it. And make sure you take a good whiff of it at the same time – rosemary is known to have mystical medical benefits such as improving memory and reducing muscular pain (two things that can be a result of stress!). Although, you may not want to do that if your dip-consuming situation is at a dinner party – you might just receive a few funny looks. You’ve been warned. Preheat the oven to 200C. Line a baking pan with baking paper and arrange 2 sprigs of rosemary and the capsicum halves, cut side facing upwards, on the tray. Roast for 40 minutes or until the capsicums begin to turn blackened and charred in a few spots. Set the pan on a wire rack and leave to cool (slightly warmer than room temperature is fine). Meanwhile, toast the sunflower seeds and pumpkin seeds in a small frying pan over a medium-low heat for five minutes, or until fragrant. Toss the pan every so often to prevent uneven toasting. Once the capsicum has cooled, roughly chop and toss into a food processor, along with the toasted seeds, the 2 fresh sprigs of rosemary, cayenne, salt, pepper and lemon juice. Blitz until quite smooth (the amount of texture is up to you), stopping to scrape down the sides regularly. Taste and season with more salt/pepper/cayenne accordingly. Transfer the dip to a glass jar (or airtight container), layering it with the basil leaves. Dip will keep in the refrigerator for up to a week. Serve with bread, crudités or crisp-bread. Alternatively, pop in a wrap/sandwich! Source: Adapted from The Green Kitchen by David Frenkiel & Luise Vindahl. This dip looks amazing. Thanks for sharing.